The perfect scent for anytime. During dinner, in the nursery, while reading a good book, meditating, or studying for finals, this fragrance does not overstep its boundaries. We mixed sandalwood with vanilla to cut down on the sweetness. Sheer genius. This is a good [safe] scent to gift to someone you aren't too familiar with. Pale taupe. Our 4 " pillar burns for approximately 100 hours..
Our 6" Vanilla Sandalwood burns for approximately 200 hours. Our 9" Vanilla Sandalwood burns for approximately 300 hours. 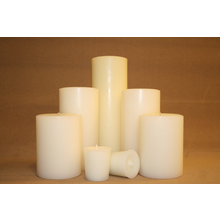 Our Vanilla Sandalwood votive burns for approximately 15 hours.